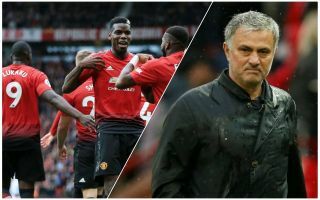 Manchester United manager Jose Mourinho has aimed a subtle dig at the club’s summer signings with the claim that while his big six rivals have improved, his squad hasn’t. The Red Devils brought in Fred, Diogo Dalot and backup goalkeeper Lee Grant in the summer transfer window, but it’s fair to say they haven’t contributed a great deal to this campaign. Fred was by far the biggest name to come in for United, though he has not performed as expected and has recently slipped down the pecking order in Mourinho’s first-team plans. Dalot, meanwhile, looks a decent young talent but has been held back by some niggling injury problems since his move from Porto, and so one could argue Mourinho has a point about a lack of real improvement to his team. That said, the Portuguese surely needs to be doing more to boost the confidence of the players he does have, with previous signings like Alexis Sanchez, Paul Pogba, Romelu Lukaku and Nemanja Matic also all being far from good enough and playing far worse than they have shown themselves to be capable of in the past. ‘I think last season, to finish second and to play the FA Cup final and to qualify in the Champions League group as first, I think last season at all we didn’t get the credit we deserve,’ Mourinho is quoted in the Metro. ‘All of the teams, they got better, they got better. ‘Spurs was the team that didn’t make a direct investment but the best investment is to keep the top players that you have.